From continually demonstrating our skill, passion and integrity towards clients, Barrington is very proud to be awarded the highest possible accolades within the industry. This includes The Guild of Master Craftsmen and the Federation of Master Builders, while we are also proud members of the Federation of Small Businesses, and government-supported Trust Mark members. The Guild of Master Craftsmen provides members of the public with a database of skilled and reputable professionals who are masters of their particular trade. All Guild members are thoroughly assessed to earn the right to be called master craftsmen. Once accepted into membership, they are required to maintain and uphold the Guild's stringent professional criteria. For more information see findacraftsman.com. The federation of master builders was established in 1941 and is a recognised and prestigious organisation for exceptionally talented builders and tradesmen. What's more, the FMB independently inspects and vets its members to provide credible proof of their quality. For more information see fmb.org.uk. Barrington is an active member of ICON, A professional body for the conservation of our cultural heritage. For more information see conservationregister.com. 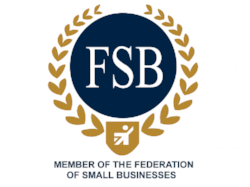 Barrington is proud to be a member of the federation of small businesses. For more information see fsb.org.uk.